When evangelical politicians pronounce on topics like the origins of the universe, the results are almost always awful -- embarrassing, infuriating, unwatchable. When a reclusive, visionary filmmaker like Terrence Malick treats the same subject matter, as he does in his new movie The Tree of Life, one is transported. Which is a useful reminder that the mysteries of creation are best grappled with through art. The book of Genesis, after all, begins not with scientific description or theological argument, but with a poem. The Tree of Life, very much like poetry on celluloid, is a wondrous meditation on the nature of being. With what film critic A.O. Scott calls "disarming sincerity and daunting formal sophistication," the film explores not only who we are and where we came from, but also the costly and often painful features of our being human: memory and desire, loss and grief, estrangement, regret, and reconciliation. These realities are at the film's core, and a conventional storyline about the sudden death of a beloved son and brother provides the platform for their remarkably unconventional treatment. Malick has made a film that also wrestles with the paradoxes of biblical religion and, like scripture, refuses easy resolutions and empty platitudes (unlike pandering politicians). The film opens with the text of Yahweh's famous answer-question to the suffering Job: "Where were you when I laid the foundations of the earth?" The remainder of the film is framed by a series of voice-over prayers to this God -- desperate whispers, resigned groaning, hopeful pleas -- uttered from within a family's fog of grief and despair. As the story unfolds in a middle-class neighborhood in Waco, Texas in the 1950s, we witness a mother's gentle grace, a father's unpredictable cruelty, and the joys and pains of three young sons caught in the grip of both. (The children in this movie are a revelation; the oldest boy, Jack, is played with stunning sensitivity by newcomer Hunter McCracken). The grown Jack (Sean Penn), an architect whose sterile surroundings are a visual clue to his lifeless inner landscape, reveals the toll taken on the whole family decades after the younger brother's death. As the soulful, prayerful "why's" are asked of God, Malick also theologizes on the part of the "whirlwind" speech from Job that comes after "where were you when I laid the foundation of the earth": "when the morning stars sang together and all the heavenly beings shouted for joy" (38:7). As in the Bible, the film ponders the question of human suffering with sustained attentiveness to the glories of creation. There is a silent, 20-minute sequence (20 minutes, people! contemplation in a cineplex is possible) depicting the creation of the cosmos -- meant, I suspect, like a good poem, to intimate not dictate the contours of this great and beautiful mystery. But this focus on nature also reveals its contingency, its indifference, its singular concern with survival. Our questions, then, might be: Do we matter? Does our suffering mean anything? What is a human being, indeed, that thou art mindful of them? (Psalm 8:4). But also like the Bible, Malick keeps the quotidian -- our everyday toil and striving -- within the purview of the cosmic accounting of time. We do matter and our suffering has meaning as we discern our connection to a past and future not of our own making, but where redemption is possible. And it's the "tree of life" which communicates this so powerfully in the film. There are numerous shots of single, majestic trees -- easily thought of, perhaps, as more beautiful nature to enjoy in this quiet, contemplative movie. 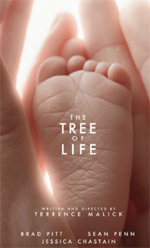 But it seems likely that this biblically-astute film (and filmmaker) are suggesting deeper resonances with our "roots," with the foundational stories of Genesis in which an encounter with a tree in a garden makes us knowing beings capable of suffering -- of both inflicting and enduring it. But the branches of the tree reach outward and upward, stretching toward the light, their intricate beauty reminding us of the delicate web of life in which we all exist. All being participates in the tree of life, this mysterious relationship of interdependence. And in the human realm we realize our full humanity as we gratefully acknowledge our mutual dependence and are able to freely love, forgive, and restore -- as the film's closing scene vividly makes evident. And as The Tree of Life also makes clear, this takes time. But in the metaphysics that inform Malick's vision of the world, where, as in scripture, nature and grace hold their paradoxical sway over our lives, we have, thankfully, all the time in the world. Debra Dean Murphy is assistant professor of religion at West Virginia Wesleyan College. She blogs at Intersections: Thoughts on Religion, Culture and Politics and at ekklesiaproject.org.